The first in the series, this book is designed to help organizations learn how to become evidence-based. Increasingly, policy-makers, funding agencies, and the general public demand greater accountability. As the work of agencies and organizations become more complex the strain on public resources grows with stronger attention being paid to methods and techniques for effective leadership, planning, and evaluation. The use of evidence-based interventions, however, must be incorporated effectively into operations and services for successful outcomes to occur. 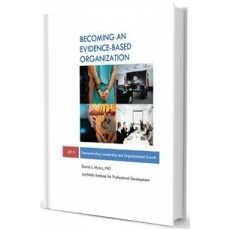 This quick read helps leadership learn to build "whole" evidence-based organizations, not just its parts. We are confident you will find it instructive.